Red and black tunic, from Sartorial…for working exclusively with pure vegetable dyes. Madder root was used to obtain the red colour, lime-resist kiryana for the splash of black, and indigo dye for the blue. The pure handloom silk was attained from weavers in Bengaluru, and the buttons from scrap indigo fabric. Ikat black kurta, grey churidar, both by Madhu Jain…for promoting indigenous forms of textile weaving and design, and giving a boost to ikat in the Indian market. The entire Uzbek-inspired collection was created by merging Indian ikat with that from Uzbekistan, to create a new weave that incorporates the sensibilities of both regions. Gypsy loafers, from Gush…for encouraging the slowly dying skill of footwear karigari. The heel of the shoes has been hand-carved by skilled artisans, who use lightweight waste wood and minimal to almost no machinery, to make sure they get the fit, shape and slope right. The tassels and embroidery are also done by hand. In spite of being a time-consuming process, the brand believes in manual handcrafting to ensure quality over quantity. Yellow flared tunic, from Kalki Design Studio…for creating home-grown natural dyes, developed from plants or flowers grown in the studio’s backyard. The yellow colour was developed from myrobalan or kadukkai flower and the red from myrobalan, alum and madder. A botanist helps to find sources from which to obtain the desired colour. Khadi layered dress (worn as jacket), from Crow…for creating a contemporary khadi-only collection that uses no dyes. The fabric was intentionally left unbleached so as to retain the rawness of the material, which is completely handcrafted. Use of the charkha reduces the consumption of electricity by machines. The leftover fabric is also used to make shopping bags or passed on to the artisans to make pillow covers. Rabari throw (worn as skirt inside), from Aish…for choosing to work with handloom and handwoven fabrics for every collection, thereby supporting the crafts communities and weavers throughout the year.The label believes in creating collections that are classic and not limited to a particular season. This scarf is made from handloom Bengal cotton, with hand embroidery and mirror-work from artisans in Kutch. Ikat clutch, from Sonica Kapur Design…for training nearly extinct artisan communities in design and production skills necessary for them to survive in the international marketplace. Ikat motifs are made by weavers in the villages of Pochampally in Andhra Pradesh where weaving is a generational skill; women prepare the yarn, men execute the weaving and the elders are involved in simpler tasks like yarn spinning on the charkha. This accessory combines traditional ikat motif with chrome-free leather that has been processed in wet white tanneries using chemical-free processes. at the end of the garment’s life. 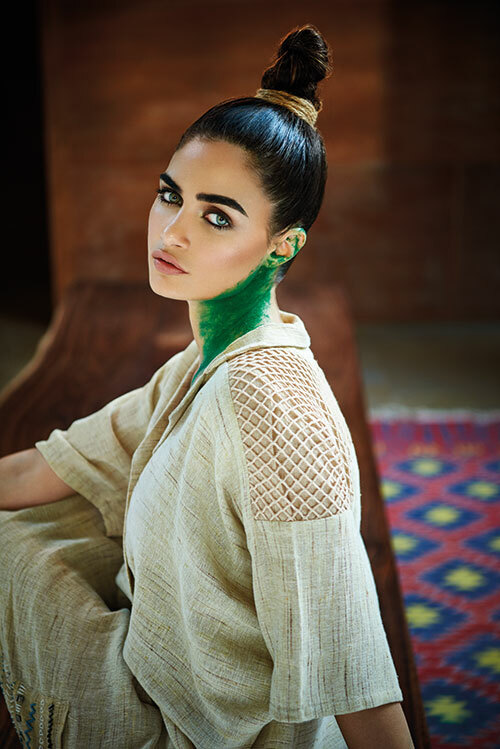 Khadi and kala cotton jumpsuit, from 11.11 / eleven eleven…for creating links between farmers, weavers, vegetable dyeing and block printing traditions, while consolidating roots in the luxury space. Kala cotton is one of the purest and oldest forms of non-genetically modified cotton. Beryl blue scarf, from No Nasties…for being a 100 per cent organic and fair-trade brand. The scarf has been made in a sustainable factory certified by SA8000, using completely organic cotton certified by the Global Organic Textile Standard (GOTS) and 100 per cent fair-trade cotton certified by Fairtrade India. In addition, factory offcuts from excess fabric were used to guarantee zero wastage. Neck-piece made with natural materials like jute, shell and bone beads, by Jamini Ahluwalia. Striped shirt, by Anita Dongre, for Grassroot…for collaborating with a network of trusted NGOs to provide a life of dignity and economic independence to artisans. The collection was made with 100 per cent cotton voile that was handwoven by women weavers belonging to SEWA (Self-Employed Women’s Association )Trade Facilitation Centre, with a view to provide a platform to showcase their craftsmanship. Cotton silk double border sari, by Suchismita Dasgupta, for Nextiles…for providing a platform to any art and textile professional, who works with the vision of developing and promoting Indian textiles. A contemporary version of the Pachhapaar sari, this was especially handwoven by the weavers in Nadia, a district in West Bengal. The brand focuses on liaising with the weavers directly without involving middlemen. Ikat jacket, from Sonica Kapur Design. Foot accessory made from scrap fabrics woven together with a jute thread, by Paromita Banerjee. Natural biodegradable linen pants, from Eka…for constantly working with handloom clusters, thereby helping families over generations, and for comfortably opting to not be in the mainstream market while offering a brand that supports an alternate fashion movement. The brand never uses fabrics that are off the rack. Instead, it has developed a strategy which works months in advance to deliver end results, choosing not to be threatened by the world of fast fashion. Hand accessory made from scrap fabrics woven together with a jute thread, by Paromita Banerjee. Merino wool and silk top, from Akaaro…for drawing attention to handlooms on a global scale. Akaaro is one of the first brands to weave their own fabric, a pioneering idea that quickly gained momentum in the industry. The top has been handwoven together with fabrics that are created in designer Gaurav Jai Gupta’s own weaving studio in Gurgaon. Blue tunic (worn inside), off-white tunic with pleat detail, both by Vibhuti Behl, for Roha…for consciously creating a collection made from kala cotton, khadi sourced exclusively from Khamir, and naturally-dyed Ajrakh prints from Kutch. Since its inception, the label has been associated with Khamir, an organisation that works to strengthen and promote the rich artisanal traditions of the Kutch district. Woollen bag, from Péro…for modernising the idea of upcycling in every collection. The bag is made from wool waste from the previous seasons, where the wool is cut into knit panels equivalent to the size of the bag, in order to avoid the accumulation of further scrap. Maroon organic cotton dress, from Upasana…for creating the local organic brand Paruthi to support India’s organic farming community. Upasana has been working with the organic cotton farmers as part of the Kapas project. Paruthi in Tamil means ‘cotton’. It is the result of a sustainable business collaborative that is striving to protect and promote the fragile cotton communities of Tamil Nadu. Wide-legged kalidar pant, by Paromita Banerjee…for emphasising the feel of ‘handmade’ and catering to global aesthetics with a local approach rooted in the handloom culture. Made from Malkha khadi with a kalidar detail of kalamkari block print, the weaving of this khadi skips the spinning mills with the yarn coming directly to the weaver right from the primary producers, the farmers. Kalamkari as a technique follows a natural process of printing which is beneficial to the village industry. Black-and-white top, made with 100 per cent organic cotton; mirror-work jacket, made from 100 per cent handloom Khamir cotton and handloom Bengal silk lining, with manual mirror work done by a cluster of craftswomen in Gujarat. Both from Aish. Tucked away in the industrial neighbourhood of Byculla in Mumbai, the property, designed by Studio Mumbai Architects, was the ideal setting for the eco-conscious premise of this feature. Located in a former tobacco warehouse, a leafy compound connects seven units that make a case for urban living as it should be. Each unit is punctured by a central courtyard, allowing foliage, sunlight and natural ventilation to flow through. The underlying philosophy of working with nature rather than against it and repurposing available resources, with an emphasis on local materials and expertise harnessed in close collaboration with skilled craftsmen, support a nuanced approach to contemporary sustainable architecture. This entry was posted in Brands and tagged 11.11, Aish, Akaaro, Bengal cotton, Bias, Crow, Eka, Fair Trade, Fair Trade India, Global Organic Textile Standard, GOTS, Grassroot, Gush, handloom silk, Ikat, Jamini Ahluwalia, Kala cotton, Kalki Design Studio, karigari, Khadi, Madhu Jain, No Nasties, Pachhapaar sari, Paromita Banerjee, Péro, Sartorial, Self-Employed Women’s Association, SEWA, Sonica Kapur Design, Suchismita Dasgupta, Upasana, Upcycling, vegetable dye, Verve, Vibhuti Behl, Zero Waste. What product you buy can determine the quality of life the maker leads. Fairtrade-certified clothes ensure that those associated with the garment are given what they rightly deserve. Ever looked at a stylish, sequined maxi dress draped on a mannequin at the mall, glanced at the price tag and thought it was a suspiciously low price? You were probably right. Behind the rock-bottom rates of fast fashion, there are often unregulated supply chains that make no efforts to pay a living wage, and also ignore the basic rights of the people who make these clothes. Price is not the only indicator, though — several luxury brands are as guilty as their lower-priced counterparts. From child labour to unsafe working conditions and low wages, the multi-billion-dollar profits of many large apparel brands often come at a human cost. Fortunately, there is a growing awareness and demand for ethically produced clothing, fuelled by consumers. The week leading up to April 24 every year has been declared Fashion Revolution Week, in memory of the Rana Plaza tragedy and to keep the spotlight on the issue. “Brands need to commit to ethical fashion”, says Devina Singh, Campaigns and Outreach Manager of Fairtrade India. “Fashion revolution is about celebrating ethical practices in fashion and asking more brands to give the consumer an option of fashion that is fair. When brands opt for the Fairtrade certification, you can be sure that the people behind your clothing and style statement were treated fairly throughout the supply chain. This includes the people who grew and made your clothes. I’ve seen transparent supply chains – it’s possible and it’s easy; all it takes is a commitment from the brand.” Devina elaborates that the Fairtrade certification is given to organisations that follow Fairtrade guidelines. Behind Fairtrade clothing lies a fair price for cotton, fair wages for the garment factory workers, empowerment of women farmers, respect for the environment and the commitment to invest Fairtrade premiums into the community that made the clothing. Technology, too, is propelling this movement forward. The app Shop Ethical! (available on android and iPhones) is a handy list (that’s regularly updated) of companies and their practices, relating to both raw material sourcing as well as worker rights. With a single click, you can find out how ethical their supply chain is, and support the brands with good ratings by opting for their products. While consumers are increasingly asking questions before they buy their clothes, there is also a growing movement against the trend of high consumption. “Buy less fast fashion, clean up your wardrobe, re-style, swap clothes, re-make your clothes and buy second-hand. If you need to buy new, buy fair trade, ethical and organic-certified clothing,” says Safia. This entry was posted in Brands and tagged Fair Trade, Fair Trade India, Fashion Revolution, Fashion Revolution Week, Fast Fashion, Shop Ethical.